Small cetaceans have been reported consumed in Peru from at least 1960 with high demand for dolphin meat driving fishermen to kill thousands of dolphins and porpoises for shark bait as well as human food (Robarts and Reeves, 2011). Total annual catches (incidental and intentional) peaked in the period 1990-1993 at between 15,000 and 20,000 animals (Van Waerebeek and Reyes, 1994). Despite bans on hunting, landing and sale of cetaceans implemented in the mid-1990s, meat and blubber from bycaught and directly hunted small cetaceans have continued to be used as shark bait and for human food in Peru although less openly (IWC60/SM19). Mangel et al. 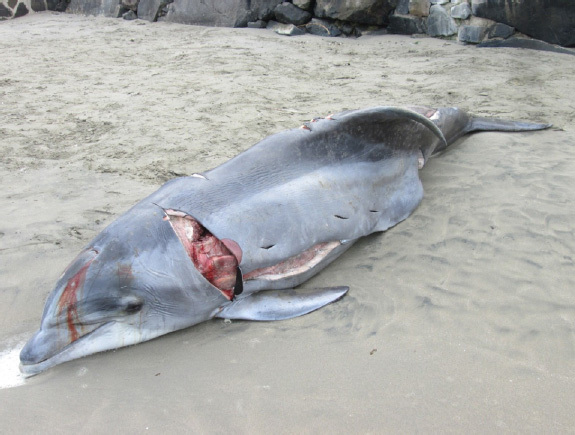 concluded in 2010 that the coast of Peru is likely still one of the world’s principal areas for concern regarding high small cetacean bycatch. 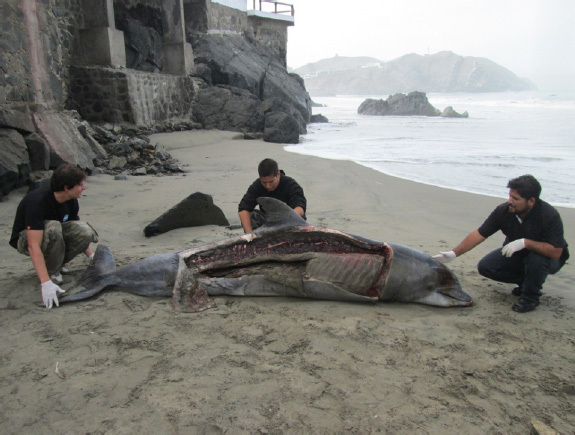 This Working Paper reports new (2012/2013) information on direct hunting of dolphins for human consumption using nets and harpoons as well as chemicals along a large stretch of coastline both north and south of Lima, Peru. Locations include the settlements of San Jose and Pimentel, about 480 miles north of Lima; Cerro Azul, about 60 miles south of Lima; Pucusana, 35 miles south of Lima City at the very southern end of Lima Province; Arica, on the southern edge of Lima; and Conchan and Lurin, in the southern part of Lima Province. It is based on (1) research conducted independently by Dr Carlos Yaipen-Llanos of ORCA/Peru in 2012 and reported in email reports and in-person communications to Hardy Jones of BlueVoice; (2) research conducted by Hardy Jones and Dr Yaipen-Llanos in San Jose, Santa Rosa and Pimentel in December 2012, and (3) research funded by BlueVoice conducted by Dr Yaipen-Llanos in the settlements of Bucama, Cerro Azul, Pucusana and Arica during January – February 2013. Dr Yaipen-Llanos was not involved in the preparation of this working paper. During an interview at the Mayoralty of San Jose, Peru in December 2012, Mayor Victor Paiva told Dr Yaipen-Llanos and Hardy Jones that he regularly ate dolphin meat and asked ten City Hall employees if they ate dolphin meat. They all replied in the affirmative. During that same visit, Yaipen-Llanos/Jones asked a woman on the street of San Jose (population 7434) how much dolphin meat was eaten in the village. She replied “the village subsists almost entirely on dolphin meat”. On 11 January 2013, San Jose City Hall informed Dr Yaipen-Llanos that five dolphins had been found stranded in San Jose. According to local news, fishermen blamed the deaths on seismic testing. However, Yaipen-Llanos reported that their remains were butchered. Local fishermen interviewed by Dr Yaipen-Llanos in January, 2013 directed him to a dead bottlenose dolphin on the beach in Bujama. It appears to have been partially flensed with a knife. See Images 1&2. Dr Yaipen-Llanos reported that four different small cetacean species are targeted for their meat by fishermen from the settlements he visited in 2012/2013: Bottlenose dolphin (Tursiops truncatus); Burmeister's porpoise (Phocoena spinipinnis); Short beaked common dolphin (Delphinus delphis) and Dusky dolphin (Lagenorhynchus obscurus). Dr Yaipen-Llanos reported that, according to local fishermen, small fishing boats hunting dolphins follow pods mainly at dusk and dawn. The dolphins are caught using nets thrown from the boats and then harpooned while still in the net underwater. This is consistent with reports by Mundo Azul in 2003 that “the fishermen encircle whole dolphin schools with nets, catch them with harpoons, lift them aboard and kill them by clubbing them to death” (Austermühle, 2003). A fisherman in San Jose told Hardy Jones in December 2012 that fishermen pour oil in the sea to sicken dolphins and make them easier to catch. Despite the health implications, they are still butchered for food. Dr Yaipen-Llanos reported that 60 sealions were intentionally poisoned with insecticide in San Jose on February 7, 2013. Fifteen long–beaked common dolphins also died and were processed for their meat. Dr Yaipen-Llanos reported that dolphin meat from animals butchered at sea is not delivered by fishermen into the main dock, but is taken to shore covertly in "undercover" boats carrying bags (typically black bags) and boxes. He was told by local security guards that dolphins were also killed and butchered in coves next to Pucusana, although navy officials he interviewed denied that they were landed there. Hardy Jones confirmed that dolphin meat was on sale at Santa Rosa market in December 2012 for 5 soles/kilo (US$1.88). He was informed by fishermen on the beach at San Jose in December 2012 that dolphin meat is cheaper than fish. A female market vendor stated to Dr Yaipen-Llanos that she distributes meat to Santa Rosa and Pimentel. Dr Yaipen-Llanos reported dolphin meat on sale at more than one restaurant in Pimentel. In addition to investigations conducted by ORCA/Peru and BlueVoice, citizens from time to time provide evidence of dolphin hunting. Image 3 was taken at Ancon, a beach community just north of Lima in mid-April, 2012 and provided to Dr Yaipen-Llanos. 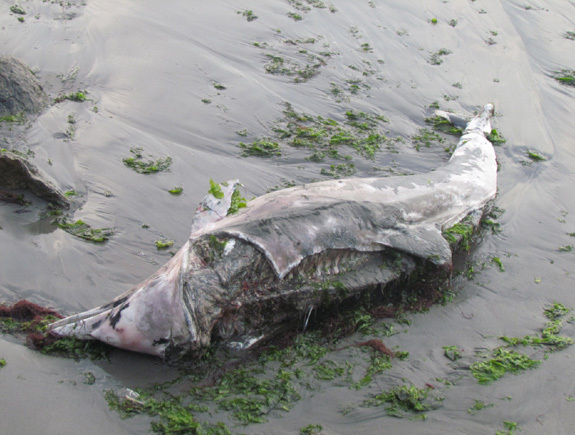 Dr Yaipen-Llanos reported that he conducted a “survey” of fresh dolphin remains on the beaches of San Jose and surrounding beaches (>10kms) on 14 April 2012 and 24 April 2012. He found the carcasses of seven dolphins with evidence of “harvesting”—meaning that they bore marks to their body (including knife marks on their bones) that he believed to be consistent with butchering. He also found dolphin bones on the beach in Santa Rosa and San Jose April 2012, December 2012 and January 2013 with marks he believed to be consistent with butchering. He also reported being shown dolphin “burial sites” by a fisherman in January/Febuary 2013; these included the skeletal remains of juveniles and adults he believed to have been caught and flensed for human consumption. Despite the prohibitions on cetacean hunting, landing and sale in Peru, fishermen continue to covertly hunt small cetaceans from small boats using nets, harpoons and apparently chemicals. Dolphin meat is sold relatively cheaply into local coastal communities where it remains in high demand. Mangel, J.C., Alfaro-Shigueto, J., Van Waerebeek, K., Cáceres, C., Bearhop, S., Witt, M.J., Godley, B.J., 2010. Small cetacean captures in Peruvian artisanal fisheries: high despite protective legislation. Biological Conservation 143, 136–143. Robards, M. D., Reeves, R. R. The global extent and character of marine mammal consumption by humans: 1970–2009. Biological Conservation 144 (2011) 2770–2786.